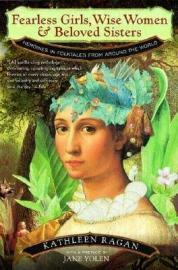 One hundred great folk tales and fairy tales from all over the world about strong, smart, brave heroines. A definitive sourcebook of folktales and fairytales and the first of its kind to feature a variety of multicultural heroines. Dismayed by the predominance of male protagonists in her daughters' books, Kathleen Ragan set out to collect the stories of our forgotten heroines: courageous mothers, clever young girls, and warrior women who save villages from monsters, rule wisely over kingdoms, and outwit judges, kings, and tigers. Gathered from around the world, from regions as diverse as sub-Saharan Africa and Western Europe, from North and South American Indian cultures and New World settlers, from Asia and the Middle East, these 100 folktales celebrate strong female heroines. In "The Mirror of Matsuyama," we see the power of a mother's love overcome even the silence imposed by death. In "Moremi and the Egunguns," a fearless girl faces messengers from the land of the dead. Fearless Girls, Wise Women, and Beloved Sisters is for all women who are searching to define who they are, to redefine the world and shape their collective sensibility. It is for men who want to know more about what it means to be a woman. It is for our daughters and our sons, so that they can learn to value all kinds of courage, courage in battle and the courage of love. It is for all of us to help build a more just vision of woman. Fearless Girls, Wise Women, and Beloved Sisters breaks new ground by reexamining our notions about heroism. This book will appeal to parents who want to foster positive role models for their children. An invaluable resource of multicultural heroines for any school library. Finally, today is the first post for my buddy read with Amy from Amy Reads. I have been very slack, but hopefully we are on track now! 1. In the introduction Ragan talks about how little truly feminist fairy tales exist in popular culture - would you agree with this? Can you think of a fairy tale that you loved as a child with a strong female lead? When I was a kid I never really thought about male or female. I just read for the sake of reading. She starts off talking about how Dr. Seuss is very male-dominated. I didn't notice that as an adult. (In my defense, I don't have children to read all these things to.) When I got a bit older, though, I started to really not like the popular stories. I started to get annoyed with the women in them and how they were often 'too stupid to function'. I really cannot think of anything when I was younger that really showed empowering women. It was only later when I started concentrating on branching out that I found empowering stories. 2. What do you think of the layout of the book and the way the stories are divided by country? I think that dividing it by country is an interesting idea. It means that when it is over you can compare the stories that come out of each country and see the similarities and differences. I have to admit, though, that part of the reason this book has been sitting on my TBR pile as long as it has is the formating. I wasn't crazy about the small text, but having read the first few stories I have found it is not as bad as I was anticipating. 3. Do you like the fact that each story ends with a short note from the author? When I read the first couple I was not entirely sure what to make of them. I didn't really understand their purpose. Once you get going, though, they are rather interesting. They make you think of things that you might not have originally picked up from the reading of the actual story. 4. The stories we looked at this week were all set in Europe, I found many of them seemed moderately familiar. I found it surprising how so many of them were similar to tales that are more popular only here the female character is the one saving the day. Would you agree? Do you think this is a trend that will continue? I enjoyed that the stories were familiar, but different at the same time. It was refreshing to tweak a few details and have a story that was a bit more empowering. The men still play a role and the stories are not always one-sided, but they show a side of stories that you don't see very often. I am hoping the stories will continue to be a bit familiar, but I am also hoping for entire originality, too. 5. Did you have a favorite from the first twelve that we read? If so, why did you like that one? I enjoyed all of the stories that we read this time around. My favourite, though, was probably 'Tamlane'. I really like retellings of the 'Tam Lin' story, so I was happy to see one included in this collection. It was not that much different than the popular story, but it was still a worthy addition to the collection. 6. The stories celebrate a number of characteristics beyond the traditional Disney ones of selflessness, modesty, beauty, etc. At first I found it hard to really see the heroine as such because of this fact, but it is one of the things I'm liking best about the collection so far - do you have a favorite characteristic from one of the stories? I think it is refreshing that there are different characteristics to these stories rather than the norm. I enjoy that the women in these stories seem normal. They are not necessarily any different than other women. They are just trying to survive and doing what it takes for that to happen. Or, not even surviving, just using their brains. I also enjoyed that they are written as smart women instead of the typical damsel in distress. 7. I found Molly Whuppie interesting because as she goes back again and again to the giants house she basically says that he lives in Spain. Do you think this was done specifically because the two countries weren't getting along and it was seen as a more dangerous place? I thought the fact she kept mentioning Spain was a bit random. I wasn't entirely sure what to make of it because it didn't seem to have any purpose. I have to admit I never considered it was because there were problems between England and Spain, but when you mention it that makes sense. Ooh, this looks really interesting so far. I feel like I've read so few folk tales or fairy tales in their original form, focusing on women. This may be one I have to seek out - I'll look forward to more of your posts! This one sounds great! Obviously one worth looking for and a great choice for Carl's challenge.